This page is about the Italian tank destroyer 105/25 M43 "G.C.Leoncello". For regular version, see 105/25 M43. The Semovente 105/25 M43 G.C. "Leoncello" is a Rank III Italy tank destroyer with a battle rating of 3.3 (AB/RB/SB). 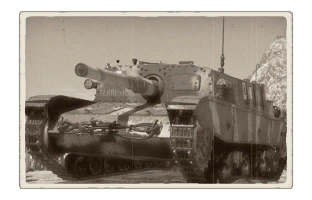 This tank destroyer was introduced in Update 1.85 "Supersonic". Powerful 105mm gun that can fire HEAT rounds. Low profile can make it difficult to spot in RB/SB. The mantlet armor can be penetrated by the majority of the guns at its Rank. In mid-1942, the Italian Army put out a set of requirements for a new vehicle that could double up as both an infantry support vehicle as well as a tank destroyer, depending on the situation. In response to this, Fiat-Ansaldo and OTO both began developing prototypes around these requirements in parallel. The two competing designs primarily differed in the chassis choice. OTO picked the newer chassis of the P40 heavy tank whilst Fiat-Ansaldo chose to opt for a newer and larger version of the chassis already in production for their Semovente M42. This decision allowed Fiat-Ansaldo to complete their prototype much sooner. In February 1943, the Semovente 105/25 M43 was presented to military officials and was soon afterwards ordered into production, following successful trials. Production began in April 1943, with a planned production run of over 800 vehicles. However, with Italy’s industry at this late stage of the war being severely crippled, production was slow and reaching such high production goals was more than unlikely. Just prior to the signing of the armistice in September, the 30th vehicle rolled off the assembly line. The Semovente 105/25 M43 proved itself in combat during the defence of Rome, where the SPGs successfully engaged German forces trying to retake the city. After the occupation of northern Italy by German forces, the Fiat-Ansaldo company restarted production of the Semovente 105/25, this time however, for the Germans. Germany only used a limited number of these vehicles under the designation Sturmgeschütz M43 mit 105/25 853(i), of which most were no longer in use by late 1944. Around 120 Semovente 105/25 M43s were built by 1944, primarily serving with Italian or German forces. By the late stages of the war, only a limited number was still in service and after the end of WW2, the vehicle was retired from service. Skin and Camouflages for the 105/25 M43 G.C.Leoncello in Warthunder Live.